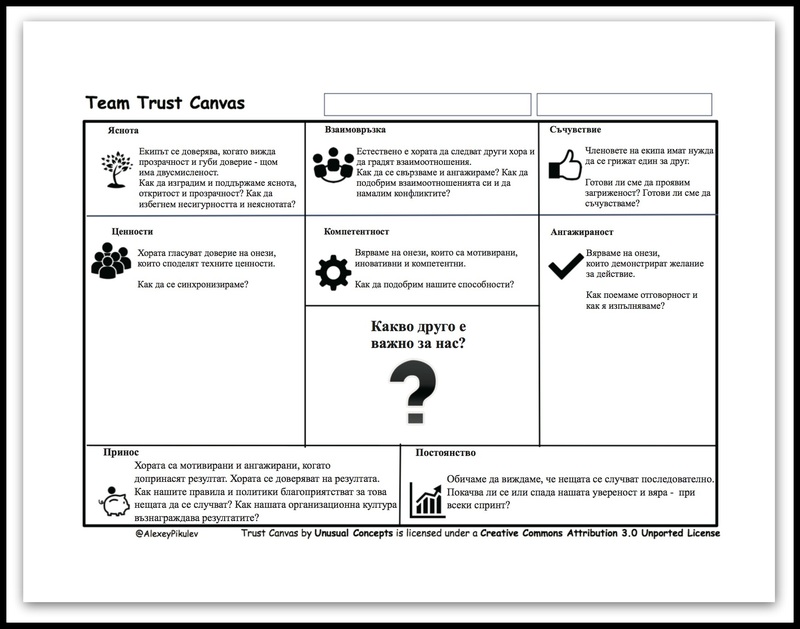 The Team Trust Canvas is available in Bulgarian – "In Team We Trust"
Hello all! We have a great news. We would like to announce that the Team Trust Canvas is available in Bulgarian now. (Many thanks to Radosveta Giuleva). Enjoy! I indeed got a chance to use it within the team. The team really liked the clear overview and insights it created. We created a team DNA out of it, on which we visualized things that are important to our team. We invite volunteers to help us translate the Team Trust Canvas (and other tools from Trust Toolbox). Please email info@inteamwetrust.com to help us out or join us in our InTeamWeTrust Slack! We really appreciate any kind of feedback which can help us to improve a translations. For any questions, reach out to the team. Previous Entry:All you need is … trust!